Wall Street is betting Sprint Corp. and T-Mobile US Inc. will soon revive talks on a blockbuster merger, but a recent surge in demand for wireless assets has Sprint exploring other ways to unleash value. Sprint’s parent SoftBank Group Corp. believes the company’s vast trove of wireless spectrum, which can be used for faster 5G services, has been undervalued, a view bolstered by AT&T Inc.’s lofty $1.6 billion purchase of Straight Path Communications Inc., according to people familiar with the matter. Executives have been bandying about ways to better reflect the value of Sprint’s airwave licenses, even entertaining the notion of spinning off some spectrum into a separate, publicly traded company, the people said. A deal with T-Mobile or another party would have to properly compensate Sprint for its airwaves, they said. While Sprint’s subscriber growth has improved and its debt has gotten more manageable, the company is still mired in fourth place in the U.S. wireless market, and a deal with third-place T-Mobile remains the most obvious way to better take on AT&T and Verizon Communications Inc. There is still enormous pressure on Sprint to make a deal, with billions of dollars of debt coming due and a network that needs investment. SoftBank’s chief executive officer and controlling shareholder, billionaire Masayoshi Son, would risk the ire of his own investors if he sought to bail Sprint out with the parent company’s money. 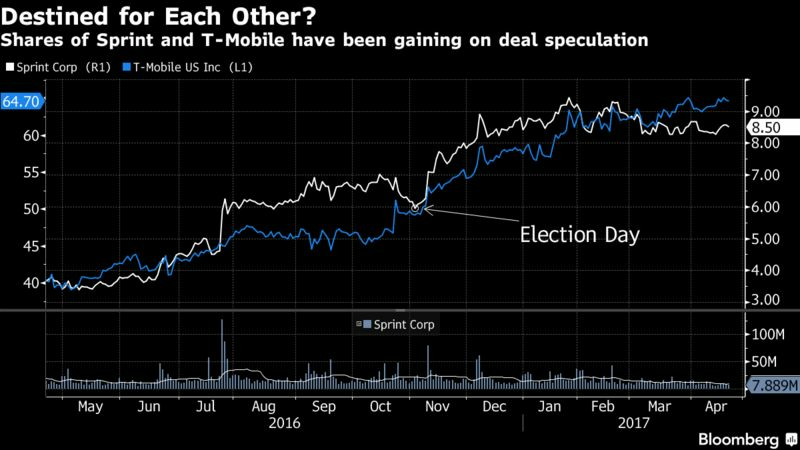 For all those reasons, a deal is still likely for Sprint. What has changed is that Sprint and SoftBank now see themselves with a wider set of options than T-Mobile alone, and a stronger hand to play in negotiations. Merger talks in the wireless industry have been on hold for almost a year because of a government spectrum auction that required participants to avoid negotiating deals with each other. That gag order gets lifted April 27. In addition to making contact with T-Mobile, Sprint also believes it could get overtures from cable companies, such as Comcast Corp., Charter Communications Inc. and Altice NV, that have entered or expressed an interest in the U.S. wireless market, the people said. Sprint climbed as much as 2.8 percent to $8.74 Monday in New York, and T-Mobile rose as much as 1.6 percent to $65.73. Shares of SoftBank rose 1 percent to 8,174 yen at the close in Tokyo. Sprint CEO Marcelo Claure and his team have made extraordinary efforts to stabilize the business by slashing costs and pawning assets. Sprint has improved its liquidity to more than $11 billion thanks to a series of debt transactions that have cut the company’s reliance on the high-yield market. It’s earned ratings upgrades from Moody’s Investors Service and S&P Global Ratings, though S&P noted that “significant” maturities are approaching in the coming years. Moody’s estimates the company’s cash pile should last about 18 months. 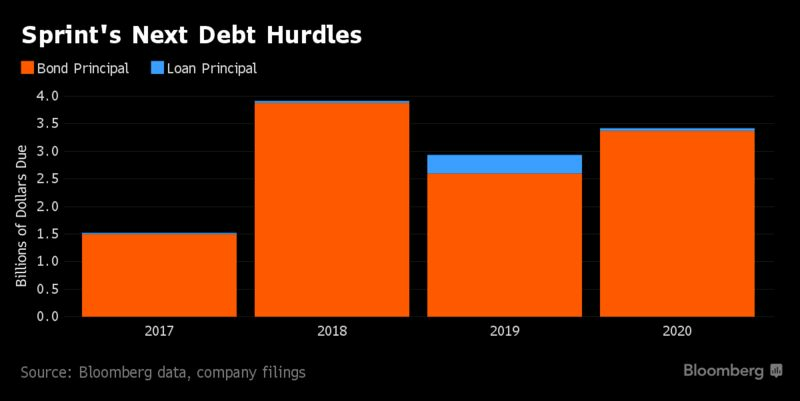 The company is contending with more than $11 billion of debt maturities due through 2020. It has $1.3 billion of bonds due this year, and $3 billion that mature in 2018. It will also make $2 billion in interest payments alone this year. Some of Sprint’s debt uses a portion of its spectrum as collateral, so spinning off a part of those 2.5 gigahertz wireless airwaves into a separate company would be thorny and complex, possibly requiring major debt restructuring. That’s why Sprint executives are against the idea, and it hasn’t gained much traction, one of the people said. Still, the fact that the strategy has been discussed underscores Son’s willingness to explore all avenues to bolster the company’s prospects. While Claure has stabilized the company, remaining independent isn’t an attractive option for Sprint. Even if the company isn’t bleeding as much cash as it once was, its financing is limited. Sprint has the most 2.5 gigahertz spectrum held by any U.S. carrier, but without cash it can’t turn those airwaves into a network that is better than its rivals at delivering faster movie downloads and live-TV feeds. “The only logical endgame for SoftBank is to merge Sprint with T-Mobile,” said Bill Zox, chief investment officer for fixed income at Diamond Hill Investment Group Inc.
Sprint is in position for a potentially more deal-friendly period under the Donald Trump administration. But the company is already the largest borrower in the high-yield market, so SoftBank, which owns more than 80 percent of Sprint, would have to foot the bill for an outright acquisition of T-Mobile. Any other type of merger would require the cooperation of T-Mobile’s owner, Deutsche Telekom AG. “Sprint can’t buy T-Mobile unless SoftBank writes a huge check because they just don’t have the equity currency to maintain control and the combined business is not really leverageable to buy a controlling stake in T-Mobile,” said Mark Stodden, an analyst at Moody’s. Son, who became Japan’s second-wealthiest person by leading dozens of deals, is in an unusual position with Sprint, where most of the potential deal partners are larger, leaving him out of the driver’s seat. Subscriber growth in the U.S. wireless market has plateaued over the past three years and competition for new customers has intensified now that all four carriers have adopted unlimited data prices and claim faster networks. Under CEO John Legere, T-Mobile has upended industry practices like two-year contracts and expensive international calling. T-Mobile added more than 4 million customers last year, tops among its rivals. For Deutsche Telekom, T-Mobile isn’t only the fastest growing U.S. wireless carrier, it’s the largest profit contributor. 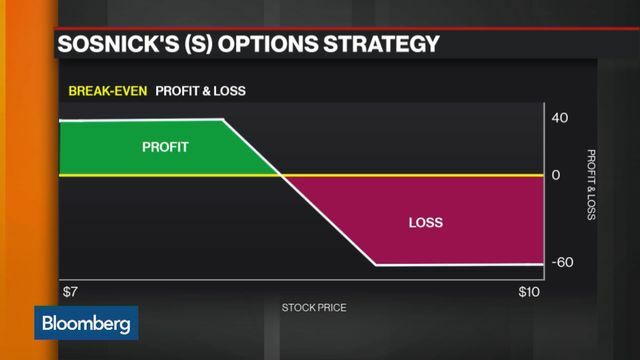 Risking that business by adding Sprint might require more incentive than just a chance to consolidate the market. Even if SoftBank and Deutsche Telekom can agree on terms, the companies will need to sell regulators on the potential consumer benefits of the combination. It may require a pledge not to destroy jobs, a key tenet of the Trump administration. Regulators could be swayed by the argument that combining two minor players could form a stronger, more effective rival to the dominant companies, said David Balto, former head of policy at the Federal Trade Commission. “People who have been advising Trump on antitrust issues want to give life to the efficiency argument, that by creating stronger firms, they’ll be more able to effectively compete and lower costs and ultimately consumers will benefit,” Balto said.